Horse Blankets began operation in 1997 when I first recognized the need for a reliable, quality blanket repair and laundering service. As an owner of show horses in training, retired horses on full turnout, and young horses yet to be started, I had first hand experience with the need to keep my blankets clean and in good repair. Given the long and especially cold Alberta winters, a prompt pickup and delivery service was particularly important. Hence the beginning of Horse Blankets, where laundering and repairs became the order of the day! 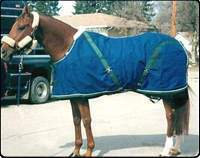 Over time, through discussions with other horse owners, it became apparent that Alberta's horses have special blanketing needs - needs that 'off-the-rack' blankets do not always meet. Alberta seasons include harsh winters, followed by variable springs, fly-ridden summers, and colder than average falls. 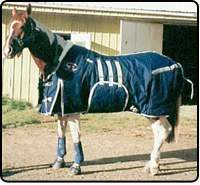 Custom fitting began, and to accommodate these weather conditions, Horse Blankets elected to construct durable, warm, and multi-purpose blankets. In addition, we incorporated innovative features such as breakaway shoulder darts, neck extenders and bellybands. Flysheets, masks and rainsheets were designed for the milder seasons. Requests for custom colours have become increasingly popular. Several of my clients ask me to coordinate the colours of their blankets with their saddle pads, polo bandages and shipping wraps. In some instances, they have chosen blanket colours to match their particular boarding stable. We always welcome the opportunity to outfit your horse in whatever colours you may desire. Over the years, I have developed many types and styles of horse blankets and accessories, some of which can be seen here in the photo gallery! All of my blankets are custom made. This means that I can incorporate all of your favorite features into one blanket, and that blanket will be fit uniquely to your horse. As I do all fitting and sewing myself, you have my personal assurance for a superior quality blanket.